Disclosure: I worked in the public library for three years; this kind of thing is a big deal to me. 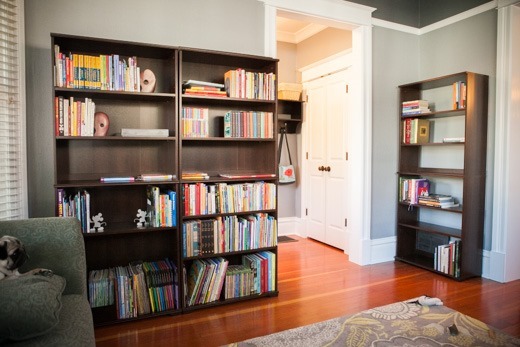 This project took some actual remodeling to happen, but I could not be more pleased with the results! I know it seems strange to close off part of an open room, but it gave us a dedicated entryway and reduced the path through the living room, making it an actual room to hang out in. The shelves themselves are just Ikea placeholders for now, but they work perfectly and look good enough. The bottom left is juvenile non-fiction, as well as our big “fact books” like National Geographic photo collections, space, geography, art. The bottom right is juvenile fiction. The seemly empty middle shelves belong to each kid. Library books and books-in-progress go here. The top left shelf is for all my travel/hiking/exploring books. Underneath that are the parenting books. 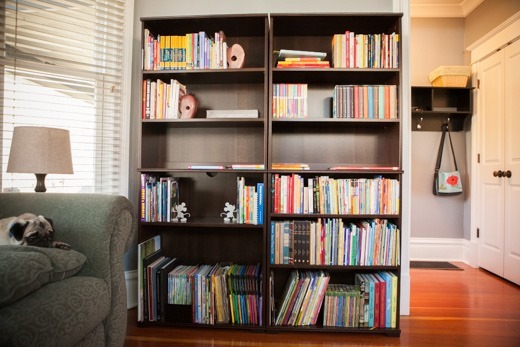 The top right shelves contain all the books-on-deck for reading aloud to the kids. This backless shelf is mostly for my books-on-deck, and library books (I read a lot). The bottom shelf houses all the family photo albums I’ve made so far. This structural change was questioned by all, but I’m so glad I stuck to my vision. This room is finally being used all the time and just feels right. 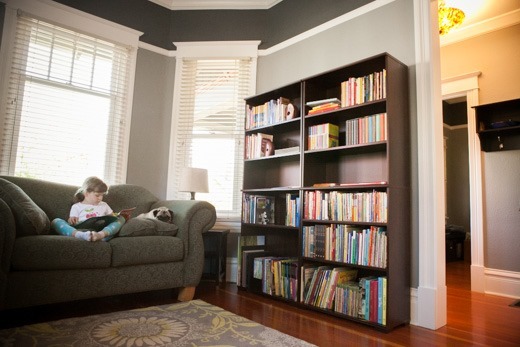 It’s a living room/library, not a passageway! 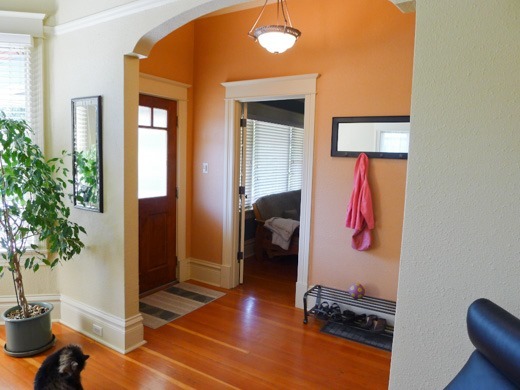 A bit of historical context: this photo of the entryway was taken the day we signed for the house in 2011. The furniture and cat are not ours. Love this!! I’m still in the process of organizing all our bookshelves in our new place; it’s making Adam crazy how long it’s taking me, but it makes a big difference!